Memory Lane/ Garden Grove Blvd. 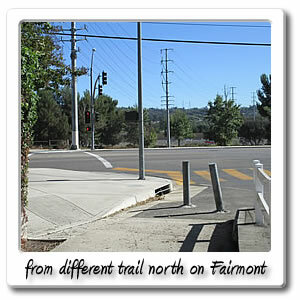 Welcome to Fairmont Boulevard on the Santa Ana River bicycle trail. 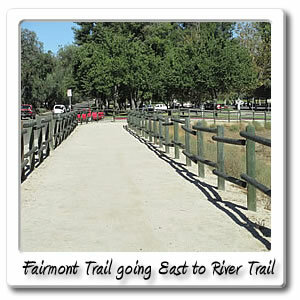 The Faimont Boulevard entry point, is not too much farther past the 21 mile marker on the Santa Ana River Trail. You're exactly 21.4 miles and 1 hour and 47 minutes from Huntington Beach at the end of the Santa Ana River Trail. It's 7.3 miles and should take about 36 minutes, to the end of the Orange County section of the Santa Ana River Trail, where it ends at Green River Road, in the City of Corona. 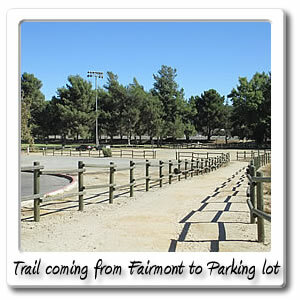 When arriving by car at the Fairmont Boulevard entry point, which can be found at Fairmont Boulevard and La Palma Avenue, in the City of Anaheim, right by the Anaheim Ball Fields. They have some free parking, in the asphalt parking spaces, and even more available in the dirt parking lot. You have to pay to park in Yorba Regional Park, but that's after going farther East. 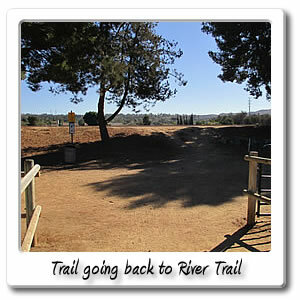 This is one of few areas by the Santa Ana River Trail for horse trailer parking, where you can also get on the dirt trails that are around the side of the Santa Ana River Trail. There's historic sites a mile or two around this area, more about that when the Fairmont Connector is mentioned just .2 miles north on Fairmont Boulevard. 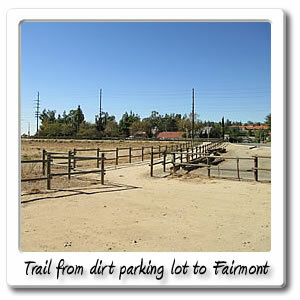 Yorba Regional Park starts right by the dirt parking lot at the Fairmont Boulevard entry point. Throughout the park there are drinking fountains and picnic tables and restrooms but, there are services about a mile west and about a mile to the East of this point. 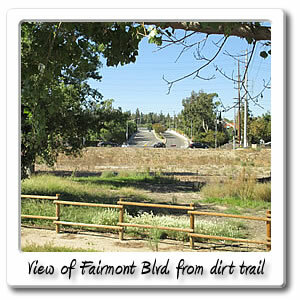 When going South on Fairmont Boulevard on the dirt trail you will come up to the section at La Palma Avenue, that will take you to the parking lot, then you will get to another dirt trail alongside the Santa Ana River Trail, or right at the crest of that little hill is the Santa Ana River Trail, itself. When you're getting off the Santa Ana River Trail at Fairmont Boulevard, you go .4 miles on a dirt trail, and you don't really know where to turn off, since there are no signs. Just remember when going east look for the beginning of the baseball fields, the turn off is about 500 feet before that. 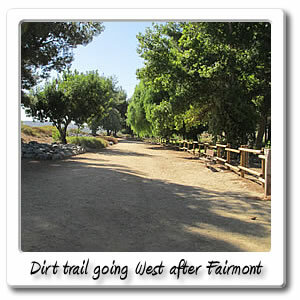 If you're going West, the Fairmont Boulevard entry point is at the end of Yorba Regional Park after the baseball fields. After going through the side of the parking lot, and going West at La Palma Avenue when Fairmont Boulevard comes up. Currently it's only on one side, along that same street. There's another Fairmont Boulevard on the other side of the Santa Ana River, but there's no bridge over the Santa Ana River, for it. There is an existing right of way on the other side, for future construction to bring it across the Santa Ana River. There aren't any currents plans to do so. Both Fairmont Boulevards are in the City of Anaheim, that's considered the Anaheim Hills area, but quickly becomes the city of Yorba Linda, when it goes uphill on Fairmont Boulevard as you're traveling North past La Palma Avenue. 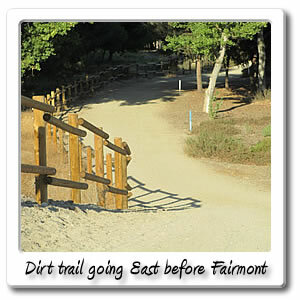 There is only a dirt trail on the right (East) side of Fairmont Boulevard, mostly for horses, but can still be used by bicyclists too, as it takes alot out of you trying to get up the hill, unless you're a very experienced mountain biker. Expect to be going slower than 5 miles per hour for the few miles that Fairmont Boulevard goes North through the City of Yorba Linda. 0.4 miles North up Fairmont Boulevard, you can go to the Fairmont Connector on the left side of the street (West). Then you can loop around to Esperanza Road. This is about 6 minutes off the Santa Ana River Trail. The only way to go is left and West on Esperanza Road, or you can take the dirt trail for .4 miles and a couple minutes for a total time of 8 minutes to Fairlynn Boulevard. It will take a whole lot less time on the way down the hill back to the Santa Ana River Trail. In addition to the Canyon Inn bar, you can also find a Circle K, and other kind of shops. If you go another .1 mile and another minute, there will be a Del Taco. You can also go another .2 miles West for a minute, you will be back at Imperial Highway, which you will have to go West under the bridge and find the sidewalk that goes on the right side of the on ramp for the 90 East, then a stairway will take you to the top of the side walk on Imperial Highway, which will also have all kinds of places to eat and other services. 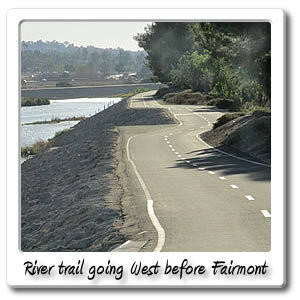 Right around the corner by Fairlynn Boulevard, there are also trails, after you come up to it from the Fairmont Connector, going down Espranza Road. Right in that area is the Yorba Cemetary. You can get to it by going North on Fairlynn Boulevard, for 400 feet after turning from Esperanza Road. You then turn right and go East on Woodgate for .1 miles (about 741 feet) and this should take about 39 seconds. Bernardo Yorba was the area's first land owner, when he was granted over 13,000 acres north of the Santa Ana River in 1832 by Mexico's Governorat that time. Yorba Cemetary makes up the small plot of land that got deeded to a Los Angeles Catholic Church, and that's all of what was left over today from the land grant in 1832. The OC Parks operates the cemetary and has tours only on the first Saturday of the month, and only in between 1 and 2 pm. 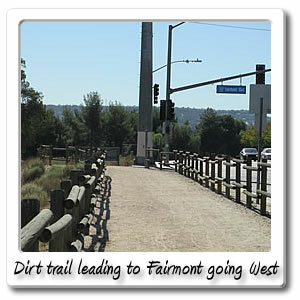 0.7 miles and 9 minutes up Fairmont Boulevard is a trail that goes to Village Center Drive. For a total distance from the Santa Ana River Trail of 1.3 miles and about 15 minutes later is the dirt trail that runs along Paseo De Las Palomas. As far as services that involve eating and drinking establishments, that you can get to without having to go up the steep hill on Fairmont Boulevard. You can go 1.4 miles West, and you'll come up to the Imperial Highway entry point on the Santa Ana River Trail, You can also go East to Weir Canyon Road, there will be quite a few other places for food and drink there too. Another option is getting off on the left side of the street .4 miles and about 5 minutes, up Fairmont Boulevard right at the Fairmont Connector. 2.1 miles and 25 minutes from the Santa Ana River Trail going North on Fairmont Boulevard is Yorba Linda Boulevard just before it starts to turn South when going East and will turn into the next entry point after the end of Yorba Regional Park. Some of the services you can find at this intersection is a Pizza Hut. We mention that first, because you will need to eat a whole pizza once you take the big incline up for a couple miles, you're sure going to need one. First thing you will see is a 7-11 and an US Bank and a couple other stores. Across from that you will find a Flame Broiler, Top Donuts and other shops. Directly across from that is the Pizza Hut, Trader Joe's, Japanese Steak House, Rite Aid and other shops. 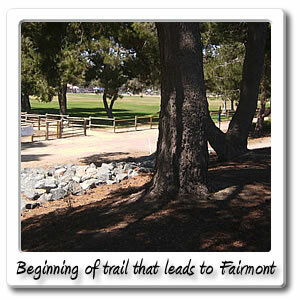 About 3 miles up Fairmont Boulevard is the end, right around by the hills, that make up Chino Hills State Park. The whole state park has over 25 miles of dirt trails up, in the protected hills where Corona is to the East. To the North and Northeast is the City of Chino Hills, when you get to the ends of the over 14,000 acres of the state park. 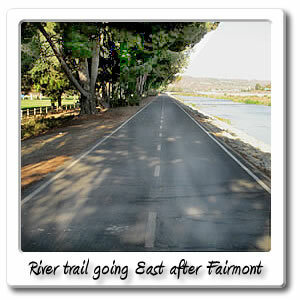 Santa Ana River Trail - © ECS, Inc. 2005 - 2019, All rights reserved. 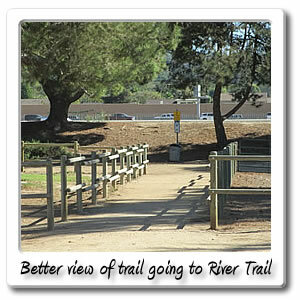 Santa Ana River Trail is a health-connexion.com partner. Website sponsored by: YourIDCard.com Be prepared for the unknown.